OOBDCopyShop is needed only then when you a) have to work with encrypted scripts and b) if they will be supplied on a central company server. Because of the way how OOBD do encrypt data, it will happen that in different workgroups different files exists, which have the same name but different rights to work with. OOBDCopyShop selects for the respective user his adequate data files and copies them in a personal directory. Even it looks very nice in windows explorer, as if netdevices or cellphones would be normal directorys, in reality windows handle it different in the background and a normal copy process will not work as intended. So you have to deal with compromises in that regards. 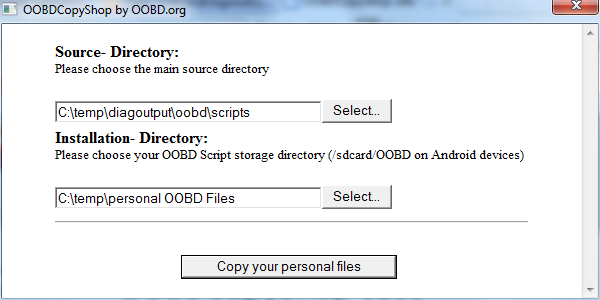 If you are not able to select the sourcedirectory directly from a network drive, or you can not copy files directly onto your mobile, then you have to copy first the files from the network into a local directory, do the OOBDCopyShop operation also just with local directories and copy the result then finally manually onto your mobile device. Not nice, but windows wants it that way..